#7381 Smooshee Smugglers "Ted E. Hush"
#7381 Smooshees Smugglers "Ted E. Hush"
Description: The Smooshees Smugglers Ted E. Hush set includes a Smooshees teddy bear and a diary for little girls to write their secrets in. 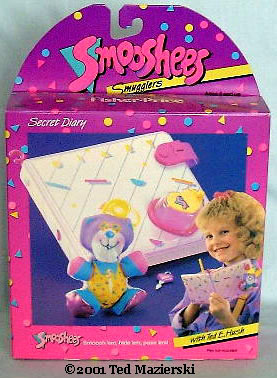 The diary is uniquely designed with a permanently attached heart-shaped charm on it that the Smooshee bear can be smooshed into! Designed for children ages 4 years and older. FPT16384 - Ted E. Hush - Smooshees teddy bear with long yellow hair on top of his head, a purple face with a white snout, a round blue nose, and wears yellow star-shaped sunglasses. His chest is yellow with multi-colored confetti on it. His arms and legs are blue, his hands are pink, and the bottom of his feet are metallic pink. The back of his body is purple. FPT16385 - Small white rectangular diary that has multi-colored designs on the cover "Diary" in yellow across the top, and a permanently attached heart-shaped charm with a clear plastic pink-tinted top, and a tiny yellow door on top. The door has a tiny yellow knob, and the door twists to the side to smoosh a Smooshee inside the charm. The diary has a pink plastic lock on the side to keep secrets private (no key required nor included).